When I got engaged, I dreamed of a Fall Wedding. Growing up in the UK, Autumn has always been my favorite time of year. I’m not ashamed to admit, I am a bit of a homebody, and nothing is more appealing to me, than curling up, in-front of a crackling wood fire, with a warm mug of cocoa, and a good book. There’s just something about the fall; the cool night air, and those crisp mornings, quenching the dry heat of balmy summer days. Fall is about warm spices, falling leaves, and harvest time. The beautiful, copper toned, Autumn months offer an array of exciting inspirations. Here’s a few of our favorite, Fall inspired Cakes. This gorgeous ganache cake was inspired by Autumn leaves. This simply, elegant cake features beautiful hand-painted appliques; perfect for a fall wedding. The cake was designed and created by Rachel Teufel of Intricate Icings . 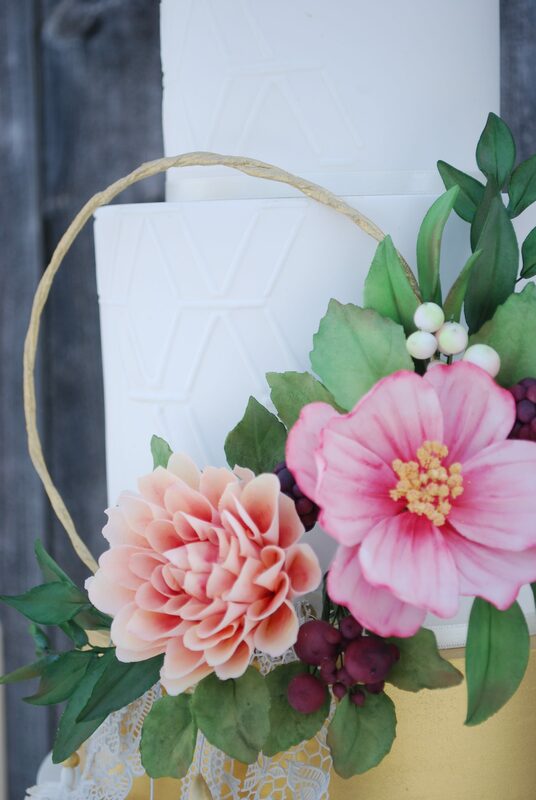 This beautiful chocolate hue’d cake by Jessica Harris Cake Design features her signature clean and simple design aesthetic. The bold patterned central tier takes center stage in this romantic and clean design. Handmade Cake Company created this gorgeous semi-naked red velvet cake. The design is garnished with persimmons, fresh berries, pomegranate seeds, along with pavlova, and raspberry cream filled meringues. Gold vines wrap around this bold, blackboard cake with delicious fresh fruits and berries and trendy succulents. Created by City View Bakehouse, this stunning copper wedding cake is reminiscent of falling confetti. This stunning cake features hand made edible metallic copper details. 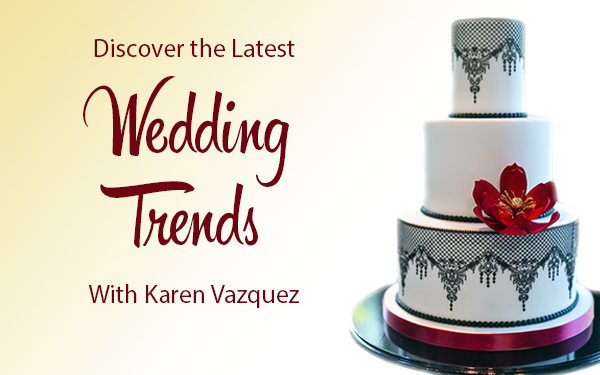 This is a bold and elegant cake for a glamorous bride. Image by Rachel Peters Photography. We can’t help but “Fall in Love” with this simple, yet elegant, fallen leaf cake by Erica O’Brien. 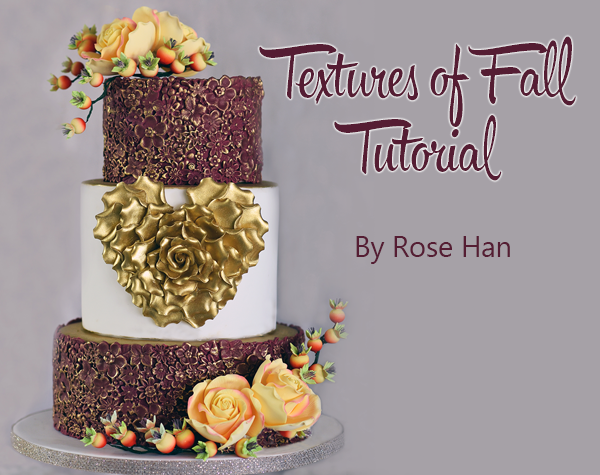 The cake features delicate wafer paper leaves in gorgeous Fall hues. We especially love the whimsical and romantic love message. This gloriously detailed and ornate design was created by Ana Parzych Cakes . This mauve/black cake is delicately piped with a beautiful lace pattern and features a floral spray in an Autumnal color palette. This bold cake with gold details would be a gorgeous centerpiece at a rustic/glam, Fall Wedding. This stunning design by The Pastry Studio features the metallic color of the season, copper. This gorgeous mocha colored cake showcases an amber, bas relief cascade. This gorgeous wedding cake by Roxycakes features delicate, gold brush embroidery and a cascade of copper toned orchids. The cake retains a traditional feel but excited with a modern touch. This tiered pie extravaganza was created by Betty Crocker for “The Royal Wedding” a riff on the ‘Something Borrowed’ theme; the inspiration behind this cake is the very British ‘pie’ or fruitcake. Each level is decorated with pastry appliques of classic leaves and garlands. The “cake” is draped with crystallized wild berries and bird shaped biscuits. Pie’s are very ‘en-vogue’ at the moment, taking the wedding dessert table by storm.